What is the rating of transformer which can feed motor 1500 HP , 4160 V and 60 HZ ? Ganesh, I agree with you, It should include the KVA of the loads connected to the transformer before starting the motor. Including the loads KVA to the starting KVA of the motor may end up with the transformer size is incorrect (VD% is above the limit. Comment of Jignesh Parmar is highly appreciated. Please note that in thi volatge drop calculation existing load on transformer is not considered. 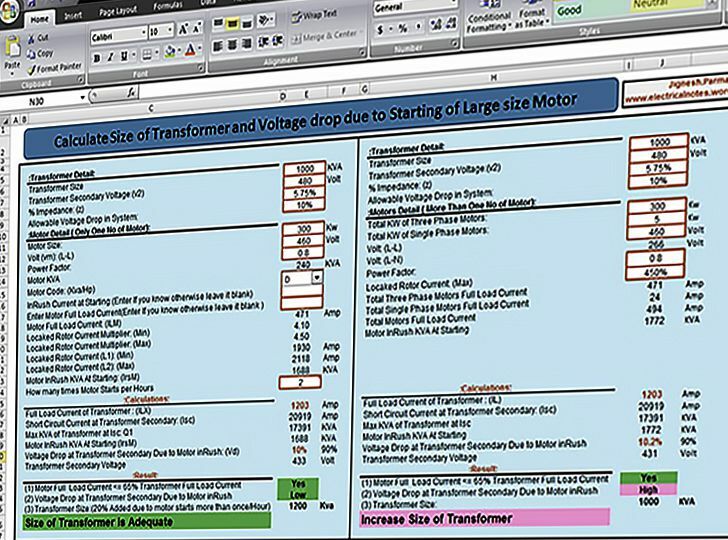 only motor starting KVA is considered for voltage drop calculation. Kindly tell me how to consider other conneted load in this calcullation. To calculate sizing of Transformer 30% future expansion should be considered. This calculation has two mistakes. 1. You have not considered the existing load in the transformer during motor starting, as if we are starting the motor alone without any other load. Normally transformers will be loaded 50% of its rating. So atleast you have to consider 30 to 40 % load in the transfomer and add that to the motor starting KVA. Here it is around 300 to 400 KVA. IF you add that the transformer selection will be wrong. 2. Motor starting KVA can be calculated directly from starting KVA/HP, converting KW to HP, which will be 400HP*4.5 = 1800KVA, which is correct way of doing. In that case your figure is wrong. In both cases the transformer will not be suitable. Usually in LV MCC, motor KW is restricted to 160KW the maximum due to the above reasons. otor starting KVA can be calculated directly from starting KVA/HP, converting KW to HP, which will be 400HP*4.5 = 1800KVA, which is correct way of doing. In that case your figure is wrong. In both cases the transformer will not be suitable. where from u get this.?? Calculation is good but i understand that it does not include starting method of motor??? or does it include this effect in form of motor code. This is one gray area I am not clear about. Can you please confirm the same please…. the excel spreadsheet is not in downloadable format. so i have not been able to download the table even though i can see it in pictorial form. Spreadsheet is downloadable and link works. Did you register at EEP? Please check your calculations otherwise give password so we can correct your mistakes (E13 is incorrect as kVA increases with a lower PF not decreases.